In an effort to see if Japanese tattoo designs have any influence on Stanford students' tattoo designs, I ventured out in search of people with tattoos to interview them about why they got their tattoo, how they chose to design it, whether or not to use color, how they chose to place it, and if they would consider getting another one in the future. Using these basic questions to get the conversation started, students began elaborating on their particular tattoo designs. Alicia Menendez: Alicia is a talented dancer attending Stanford with two tattoos. The first is a textual tattoo and the second is a symbol. She chose the quote in Latin that translates into English as, “he who conquers, conquers himself” because she believes in it and thinks that people should consider this when making decisions. When she went to the tattoo parlor with her father after two years of waiting to get it, she initially wanted it small and vertical on her ribs. With the influence of her father, she chose to change her design to one of larger font and vertical orientation. She chose the font design because she found it visually attractive and feels that it represents her personality. The second tattoo is of the Pisces symbol because although she doesn’t believe in monthly horoscopes, she believes in what it represents and thinks that the description reflects her personality well partly because she is a twin and the Pisces drawing is of twin fish. She thinks that her next tattoo will be a small black ink drawing of the two fish in a yin yang design. When asked about color preference she said that she doesn’t like anything too flashy and prefers small, simple designs that are visually pleasing. Her quote tattoo and Pisces symbol were on her ribs and behind her ear. She described that she wants to be able to conceal them when in a professional environment. Alex Lee: Alex is a Product Design Major at Stanford and has one tattoo of a refugee boat. Originally he wanted the Ship of Theseus because it represented identity. Alex described the ship's meaning as, if there is a ship that exists over 100 years, the ship will start needing repairs until it is no longer made of the original materials. Is the ship the same ship as the original? This relates to humans developing and changing overtime and questioning what is consistent, if anything. Alex morphed this idea into a refugee boat because his parents escaped Vietnam in the 1970s on a similar boat. Initially he looked at images on the Internet for design influence but ultimately tweaked an image to his own creation with the help of his friends and family. The planks, for instance, were designed by Alex while the balance of white to black space was designed by his family and the people close to him. 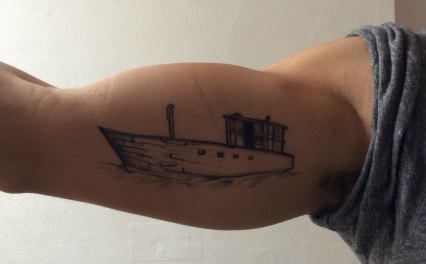 He chose to have the boat as a profile on his bicep because it is a clean look and can be easily hidden. The bicep placement is also on the inside because the tattoo is for himself and it is close to his heart reflecting family intimacy. Kelly Kirshner: Kelly attends Stanford University and got her first tattoo when she was 16 of the outline of a star and the number three on her wrist. She said that they were both poorly done and juvenile so she went in to another tattoo parlor when she was 18 to get them covered up by another tattoo, which is the rose we see on her wrist today. The wrist is viewed as the perfect spot for Kelly’s tattoo because it can be displayed yet easily hidden with bracelets. 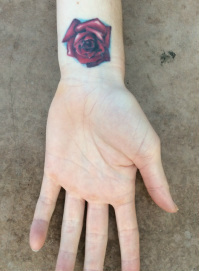 For Kelly, the rose signifies inner beauty and this is the reason she chose to design her tattoo with color. The drawing of her tattoo was found on the Internet when Kelly arrived at the parlor and from there she allowed the tattoo artist freedom to develop the shading contrasts. Tristan Poasa: Tristan is a Symbolic Systems major at Stanford and has a half sleeve tattoo on his right arm. He chose to only have a half sleeve because he can cover it for work, but since it is on his arm, he can see it all the time. His tattoo is a reminder of Hawaii, his home, where tattoos are very popular. Tristan came up with his design by combining different designs from cultures such as Hawaiian, Samoan, and Polynesian that are all part of himself and his family. He collected these designs off of the Internet and from other people around him, and the tattoo artist wove them together in such a way that united the cultures. The design itself is very open which Tristan describes as giving both himself and the tattoo room to grow. 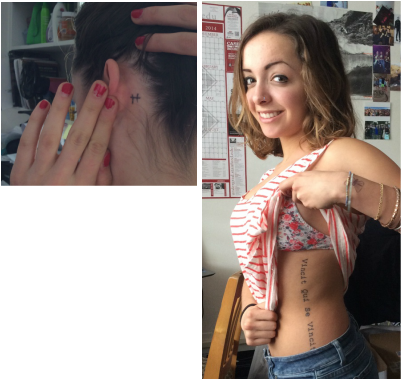 Naomi Cornman: Naomi is a coxswain on the Stanford Women’s Rowing Team with two tattoos. The first is the outline of a star on the inside of her left wrist and the second is an anchor on the inside of her right ankle. She feels that having the tattoos on opposite sides of her body gives her a calming balance. Her next tattoo will be a meaningful verse of a poem written in cursive down her spine. Since it will be in the middle of her body, the tattoo will not throw off her balance. Naomi described that she chose the inside of her body for both of her current tattoos because they were for her, not the outside world and because she wanted to be able to conceal them from future employers. When asked about her tattoo “style” she said that she preferred simplistic, small designs in black ink. Her style may change in the future however because she likes the watercolor tattoo design. This water color style of tattoo design reflects the gorgeous colors typically used in Japanese tattoo designs. For influence on the design of her tattoos, Naomi used the Internet. She found an image of an anchor that she liked and drew her own design from it. 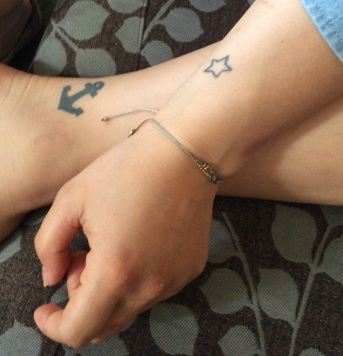 When asked why she chose to have that anchor filled in and just the outline of the star, she responded that this is the way she saw the designs depicted on the internet and had not really thought about it. Jordan Morris: Jordan plays on the Stanford Men’s Soccer Team and has Type 1 Diabetes. According to Jordan, he is supposed to wear something that can identify this medical condition such as a bracelet or necklace. 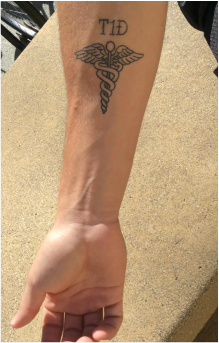 Instead of jewelry, Jordan got a tattoo of a medical symbol with T1D above it to alert others, such as first responders in a medical emergency, of his condition. He chose to place the tattoo on his wrist so that it could be visible and also concealed in a work environment. In terms of tattoo design, Jordan found the medical symbol online. He chose not to shade it in because he heard that shading was painful even though the tattoo artist advised that it would look better shaded. The font that Jordan chose was aesthetically pleasing to him and initially he was going to write out, “Type One” on top of the symbol and “Diabetes” on the bottom, but he said that this was too much lettering. This is the reason he shortened it to T1D. When asked if he would consider getting another tattoo, he responded that he would get just one more of the name of a bible verse on his bicep, which would also be in black ink. Jordan likes simplistic tattoos so he stays away from color. 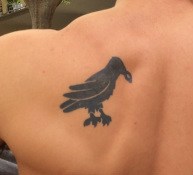 Andrew Terejewicz: Andrew is on the Stanford Men’s Rowing Team with at tattoo of a Raven with a ring in its mouth on his left shoulder. He placed that tattoo here so that he could easily conceal it when he needed to. The tattoo was designed by his twin brother’s friend and is part of his family crest dating back to the 1600s. He and his brother like simplicity so they chose to have the friend design a very simple raven without a lot of design or color so that it could be filled in with black ink. For Andrew, the tattoo is a symbol of his bond with his brother and serves as a connection to his family. Kristina Bassi: Kristina is a part of the Stanford Women's Field Hockey Team and has two tattoos. The first is on her upper back and was designed by her grandma to represent her Chinese heritage, and translates to English as knowledge and courage. Kristina said that her grandma wrote the Chinese lettering and they found a matching yin yang symbol to the one drawn by her grandma to use for tracing purposes at the tattoo parlor. She got the tattoo of California because she feels that she would not be the way she is if she didn't live here. Originally the tattoo was designed as the outline of the state with a star over the Bay Area because that is where she is from. However, the tattoo artist advised against it because over time the star would fade into the outline and he said it would no longer look aesthetically pleasing. Kristina chose to get her tattoos on her back and ribs because they are discrete places because she does not want others to judge her for her choices and feels that her tattoos are for herself and not the general public. Nina Ligon: Nina is a sophomore at Stanford University and has one tattoo representational of her heritage on the left side of her back that. Since she is half Taiwan, she picked 4 numbers representing a meaningful year and and used the Buddhist calendar to design her tattoo. After thinking about ideas for 3.5 years, she thought of this date and within three months got the tattoo. Within the three months, she designed her tattoo by first looking at what traditional Buddhist numerals look like on the Internet and then attempted to draw what she liked the best. She then took the drawing to the tattoo artist and showed him the elements she liked and those that she wanted to change. The final design was a mixture of both her work and the tattoo artist's work. When she consulted the artist about placement, she had never thought about getting it on her back but knew that she didn't want people to associate her with her tattoo upon first impressions. She was primarily worried about future employers and this is why she chose to take the tattoo artist's advice and get it on her back. 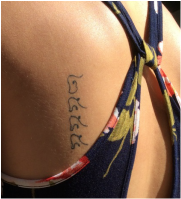 While people in Taiwan immediately recognize the numbers, people in the U.S. ask her if her tattoo is of elephants or vertebrate. She loves the odd interpretations people come up with for her tattoo design. Evan Bowechop: Evan is a junior at Stanford University and has one tattoo spread across his back. During his senior year of high school, he considered getting a tattoo, but only if he could find the right design. Since he is Native American from northwest Washington, he wanted a tattoo that would be representative of his culture. Towards the end of senior year he asked one of his cousins, who is a cultural artist, to sketch a wolf design. He said that he liked it so much that he decided it was worth getting as a tattoo. Since the use of color is important in the cultural art of his tribe, it made sense for his tattoo to have color. In terms of placement, he decided that he wanted the tattoo on his upper back because it is an easily concealable part of his body, and was large enough of an an area for the chosen design. When asked if he would consider getting another tattoo, he replied that he wanted a tattoo to show his cultural pride and that another one wouldn't be necessary. I found it difficult to find Stanford students with tattoos because those who have tattoos are aware that employers look down upon those with tattoos, so people tend to avoid flashy locations. All of the students that I interviewed described particular ways that they would hide their tattoos from their future employers such as by wearing long sleeves or by applying makeup. Cornman and I discussed during her interview that the generation before ours is strongly against tattoos, which can be explained through the shifting of tattoo symbolism with technological innovation. Western tattoos were a symbol of wealth and cultural knowledge before the invention of the electric tattoo machine but since this machine quickened the time it took to get a tattoo and also made them cheaper, tattoos began to spread within the lower classes and their symbolism shifted to being once again, unsophisticated. Cornman and I therefore concluded that the generation before us are still living in this mindset, however we are curious to see how the perception of tattoos will change when our generation becomes employers, since tattoos are becoming more and more popular as design advances. A common theme among the design of tattoos was simplicity, which is on the opposite side of the spectrum from traditional Japanese designs. I was only able to find two people who used color in their tattoos and only one had used vibrant colors similar to the colors that are used in horimono design. Through my research, the difference between American design and Japanese design as discussed by DeMello is illuminated. She suggested that American tattoos are "independent, badgelike designs" which can be seen through the designs chosen by students. The only design that I found conflicting with DeMello's theory is Poasa's tattoo but his design does not have a basis in American culture. If I were able to interview all of the students with tattoos, I would be curious to see if any of them considered the Japanese style of molding "badgelike" designs into a thematic background.